An unflinching, hard-minded look into faith and doubt. In a highly engaging storyline, Eclipse of Faith chronicles a journey: a reluctant journey of one man questioning his faith (to the core of God's very existence), exploring options, and coming to unconventional conclusions. It's a journey guided by the great thinkers of human history and a journey that explores the faith-claims of many religions from the view of each faith's most faithful: their leading teachers, thinkers, and most revered holy men. Join the author in a disorienting whirl of a worldview being examined, then clarified. Ask yourself: Why do I believe what I believe? And, how do I know it is really true? One man's doubt caused him to scour the world's leading religions for answers. What he discovered changed him forever. 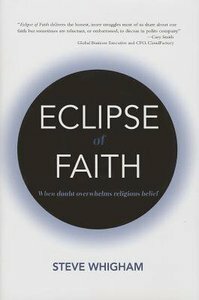 Follow his unsettling journey in Eclipse of Faith.